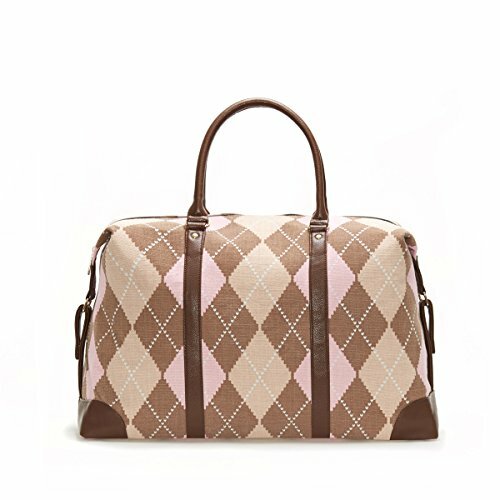 This Lulu Dharma Argyle Duffle bag will be the best travel accessory for upcoming trip or vacation! This spacious, oversized carry on style bag features 2 sturdy vegan leather handles and plenty of space to pack all the essentials. Take this stylish bag with you on your honeymoon, or even just on next weekend vacation to the beach, no matter what you will be the envy of everyone! DROP - Top-Handle Drop - 10"
GIFT IDEAS FOR - Women, Men, Boys, Ladies, Girls, Teens, Children, Wife, Mom, Daughter, Girlfriend, Her, wedding gifts, girlfriend gifts, last minute gifts, bridal shower gifts, birthday gifts, teacher gifts for women, college gifts, teen girl gifts, engagement gifts, anniversary gifts, wife gifts, graduation gifts, Bridesmaids Gifts, Gifts for her, holiday gifts, gifts for women. SHOP WITH CONFIDENCE - 100% SATISFACTION GUARANTEE, NO HASSLE RETURNS, FREE SHIPPING WITH AMAZON PRIME. Shop confidently, we offer the best price, deals, daily deals, deal of the day, discount, sales, prime deals on our amazon handbags. LULU DHARMA STORE - These bags are sold by Lulu Dharma, a leader in affordable Accessories, Fashion, Purses, Handbags, Totes, Shoulder Bags, Hip Bags, Top Handle Bags, Weekender Bags, Clutch, and Cosmetic Bags. DUFFLE BAG DETAILS: MATERIAL: Classic Argyle Design colors on Gorgeous Linen Fabric and Eco- Friendly Brown Vegan Leather Handles, bottom and trim. HARDWARE: Gold Toned zipper, buckles and fastenings. MEASUREMENTS: 22in x 15in x 8in This is the perfect bag for travel, but this bag also makes a great diaper bag, camera bag or can be used as a great large gym bag to carry all of your essentials! WEEKENDER BAGS FOR WOMEN - These weekender bags differ from other overnight bags because they are larger, classically designed, and perfect to carry your weekend essentials wherever you're planning to go during your trip! They are large enough to carry a few days of clothes and any other essentials you need for your weekend away or any business trip. Our overnight bags are large, and perfect for those who sometimes can't decide what to bring or enjoy long trips and want to travel in style. LUXURY TRAVEL BAG - This amazing Weekend bag features vegan leather handles, trim, and gold-toned hardware. These bags are durable, trendy, and are also the perfect size, so you don't accidentally over pack or feel burdened by how heavy your bag is while you're traveling around. No matter if you're going on a weekend with your girls or on a short business trip, this weekender bag is the perfect accessory for travel and will make the statement that you only want the best in quality and design. CANVAS TOTE BAG FOR WOMEN - Every woman needs to have their one go to travel bag for when they go out of town with someone special or to take on their business trips and still look like a professional. Our weekender bag makes the perfect canvas tote bag type suitcase for any woman who needs to travel, allowing lots of space to pack all of your favorite outfits and your most needed essentials for your trip while still being a cute and stylish bag! RISK FREE MONEY BACK GUARANTEE - NOT IN LOVE WITH OUR BAG? CONTACT US FOR A HASSLE FREE RETURN. Our #1 priority is having a positive customer experience! Unlike many others in the industry, Lulu Dharma fashion values its customers, and if you are not happy with your Weekender Travel Bag we will give you a full refund. Shop confidently with Lulu Dharma Bags, we offer the best price, deals, daily deals, deal of the day, discount, sales, prime deals on our amazon handbags! If you have any questions about this product by Lulu Dharma, contact us by completing and submitting the form below. If you are looking for a specif part number, please include it with your message.